Japanese bookbinding requires a very minimal tool set, but, as I stated in my last post, there are a few specialty items that make the process a little easier. My focus is now is on the work surface. 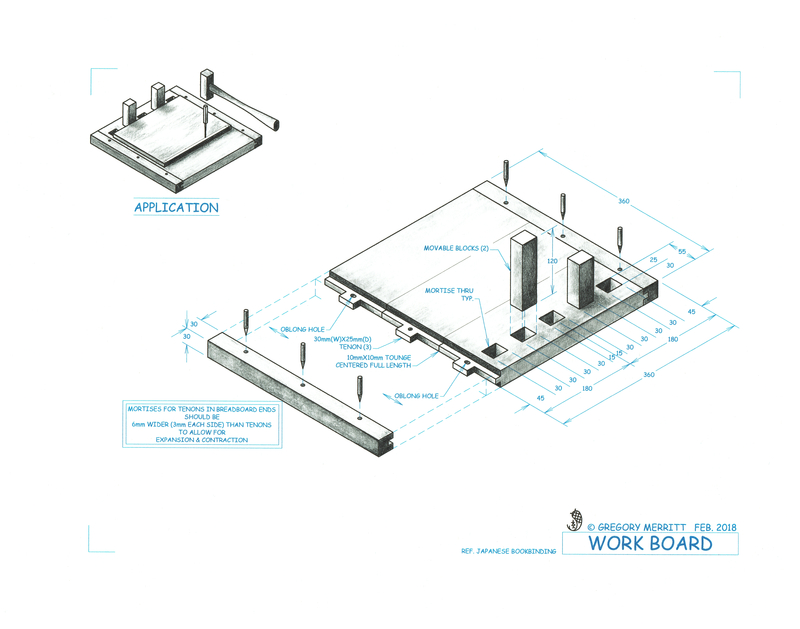 Any solid surface will suffice, but a dedicated work surface is always a plus. In this case it needs to be flat and of a material that will not damage the tip of the awl as I drive it through the stacks of paper. For my first few trail runs I have been using an old piece of plywood with a scrap board screwed to it to act as a fence for the paper. It works. Actually, it works pretty well, but I know the thin top veneer of the ply will soon begin to splinter as it receives more holes from the awl. The solid strip fence has already proven cumbersome in use. Not to mention the tendency of a single sheet of paper trying to wedge itself between the bottom of the fence and the plywood board. The book I have on Japanese bookbinding shows a photo of a “work board” that is specifically made for the task of bookbinding. There is no description of its size or structure, but I think I have gleaned all that I need from the few photographs of it. Essentially a hefty cutting board. It has breadboard ends to keep it flat and a row of rectangular mortises in which blocks are inserted to serve as a fence. These blocks can be repositioned to accommodate different size books. After a little sketching, I came up with a design and size that should fit my needs. The book does tell me that these are typically made from oak, but I have a sizable pile of southern yellow pine pieces that I need to put to use. 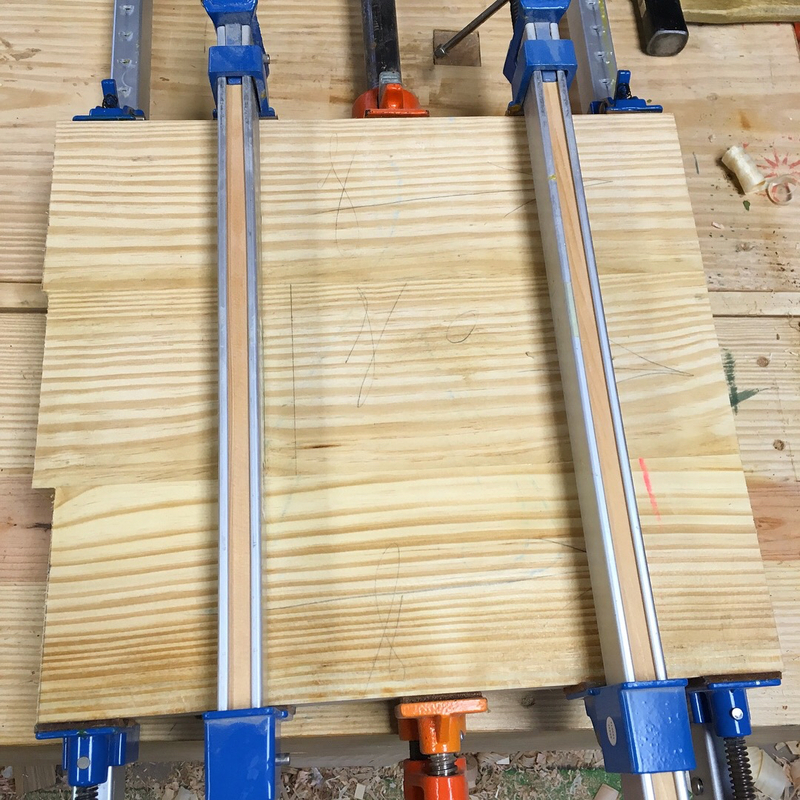 My plan is to make the field of the board from SYP and fabricate the breadboard ends and movable blocks from either red or white oak. The first step was to size and joint three pieces and glue them together. After twenty four hours, I removed the lamination from the clamps. Then trimmed it to length. Then flattened and thicknessed it. 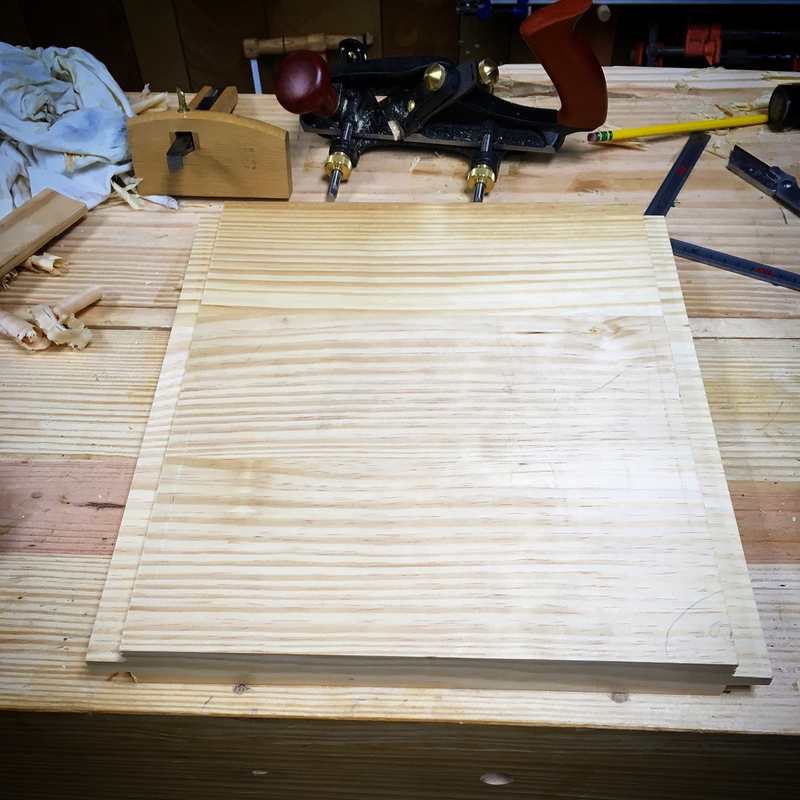 After ensuring that the board was now flat, plumb and square, I used a rebate plane to cut the tongues for instilling breadboard ends. Hopefully the weather is warm enough over the next few days so that I can make some more progress. This entry was posted in Bookbinding, Design, Illustrating and tagged japanese bookbinding, rebate plane, work board. Bookmark the permalink. I really enjoy how many of your projects open a window into another culture and another craft. Thanks! Ha…you never know what I might turn up with. In a perfect world I would be traveling the worl. Since I don’t live in a perfect world, I explore in my own way. Glad you enjoy what I’m putting on here. Looking good; nice plane. On your illustrations, your shading is cool. Do you have a favorite method for doing this? The shading is old school. 2B and 4B pencil, blended with a stump and cleaned up with a kneaded eraser. About 45 years ago, I had to bind the pages of an essay. At that time I had clamped the edge of the stack of pages between two thin boards and used an egg beater drill with a 1mm drill bit to make the holes necessary for the stitching. I considered that approach, but decided I wanted to explore the traditional method.